The simplest but most enduring symbol of commitment is Rings. It brings joys to all happy occasions like birthdays, anniversaries and especially in engagements and weddings. The early Roman era is giving rings for wedding purposes. After families reached a marriage agreement for their children, an engagement would be celebrated with an established rite. It is also important to verify that all gemstones in estate engagement rings are tight and in good condition. Engagement rings would be exchanged during this ceremony. The ring would be placed on the left ring-finger in accordance to an Egyptian belief that a very fine vein ran directly to the heart from the left finger. A woman is likely to wear every single day of her life is a ring which is one piece of jewellery and it is seen prominently. All women love to adorn them self with beautiful and attractive Jewellery articles. From last decades, mostly wedding ring was reserved for women. The money spent in buying an expensive ring is a wise investment that should bring a great deal of joy to both the recipient and the one who gives. Some people want a large ring while others diamonds altogether and opt for another type of precious stone. Rings are manufacture from various materials. These materials are Gold, Diamond, Silver, Platinum, White gold etc. amongst all these materials diamond rings are mostly loved by women. But they are expensive than gold or silver. 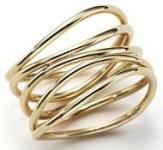 In older days gold rings are most popular. The loveliest gift to your loved one is rings. Women love this gift. In our website you will find various types of designs in various shapes for your women. Silver and white gold rings are most trendy and fashionable and popular in youngsters. Teen agers like to wear trendy silver and white gold rings. Having unique wedding jewellery is an important part of the bride�s ensemble. These days, the bridal jewellery you decide to wear is entirely based on personal preference and taste. A ring generally consisting of a solitaire diamond has become a common tradition in the West and it is rapidly spreading in India and other parts of the world. 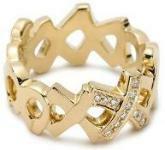 You will find some of the best designer rings in this website for your loved ones. Now times have changed. It is often said that accessories make the outfit, and your wedding jewellery is no different. In rings mostly diamond rings are most popular rings in women. They love to wear diamonds. The diamond shape you choose is simply a matter of personal taste. Diamond jewellery is also used for wedding gifts and other special gifts as diamonds represent love and purity. When you're buying a piece of diamond ornaments and especially when you're choosing a diamond engagement ring, the shape of the diamond is one of the main deciding factors. Even more important, when it comes to engagement or wedding rings, many couples are deciding that other things are more important such as buying a house or saving for their future there are times when practicality will rule over fashion, especially in today's economy. A platinum ring will normally be a about twice the price of an 18k white gold ring. So platinum would be a better choice for your ring than gold, as it will reduce the chance for loosely held gems falling out. To see if the engraved design is still visible platinum rings should be checked closely. Many wedding rings are made with a delicate designs using turquoise, which symbolized the forget-me-not flower and it was not uncommon to find wedding rings using pearls or small diamonds. It is a tradition in many cultures across the globe to exchange expensive rings made of genuine gold on engagement day to show that the two people are committed to each other and would soon marry. It is important to confirm that the ring is symmetrical when shopping for rings. Jewellery was designed to be delicate and feminine. Typically antique wedding rings were plain gold bands, not all wedding rings are plain gold. Pearl or Turquoise rings need to be checked for discoloration and scratches. If an estate wedding ring needs to be resized, make certain that all hallmarks and inscriptions are retained. These articles are composed of fancy and attractive rings for men and women in gold, platinum, diamonds and rhodium. Sometimes in harder materials the ring-prongs can scratch the surface of the gem. 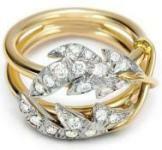 Although antique jewellery is very costly, you can find affordable estate rings and other jewellery articles nowadays. There is also a growing trend towards platinum rings, Diamonds and pearl rings will always be trendy. And which are more expensive than yellow or white gold. These will be small inlaid diamonds around the band, not a large stone like the ones you would find in a bride�s engagement ring. Pearls and crystal are a good affordable option for those who want nice jewellery without spending too much money for buying diamond rings. Elegant designs are available in this category for men and women both. Engagement or wedding rings for women and men come in various beautiful designs and styles. On engagements and wedding diamond rings are proffered than simple gold rings. Girls always love to have those stylish rings having both colorless and colored diamonds. Similarly, rings in platinum and yellow gold are popular in all parts of the world. Jewellery for men also comes in a variety of themes and looks pretty and eye-catching. The combination of metals is trend for men�s rings for example a two-tone ring with white and yellow gold, brushed to give it a muted look. Other jewellery rings aren�t the only jewellery you�ll need for your loved ones as a gift. The colored diamond has its own uniqueness and sophistication. Jewellery continues to grow as both a hobby and a profession. Another popular ring option for men includes titanium. Spectacular collection of trendy and hip hop designs is available to choose from. Among different wonderful designs, the solitaire diamond ring is commonly used for engagement or wedding rings.